Cold Spring Harbor, L.I., N.Y. December 23, 1936 Professor C. Holmgren, Rector of the Caroline Medical Chirurgical Institute, Stockholm, Sweden. Sir: I address you and your faculty as distinguished persons who, by the Code of Statutes of the Nobel Foundation are authorized to name candidates for the Nobel Prize. 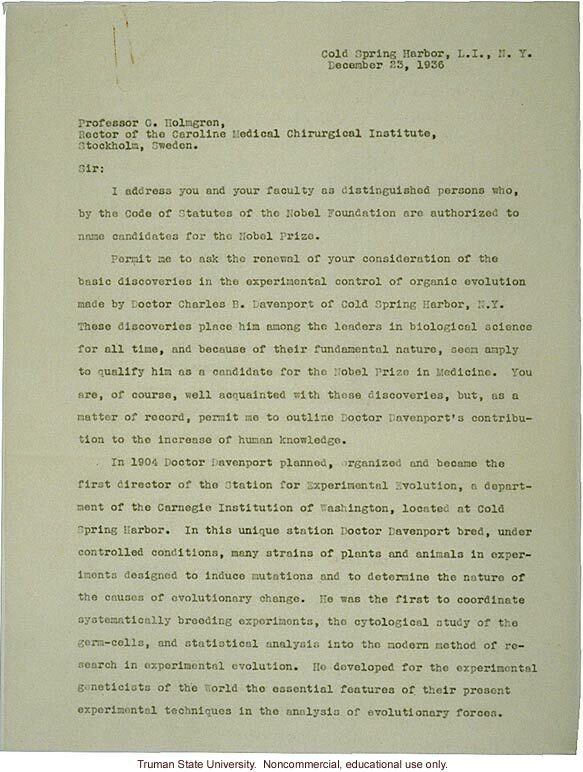 Permit me to ask the renewal of your consideration of the basic discoveries in the experimental control of organic evolution made by Doctor Charles B. Davenport of Cold Spring Harbor, N.Y. These discoveries place him among the leaders in biological science for all time, and because of their fundamental nature, seem amply to qualify him as a candidate for the Nobel Prize in Medicine. You are, of course, well acquainted with these discoveries, but, as a matter of record, permit me to outline Doctor Davenport's contribution to the increase of human knowledge. In 1904 Doctor Davenport planned, organized and became the first director of the Station for Experimental Evolution, a department of the Carnegie Institution of Washington, located at Cold Spring Harbor. In this unique station Doctor Davenport bred, under controlled conditions, many strains of plants and animals in experiments designed to induce mutations and to determine the nature of the causes of evolutionary change. He was the first to coordinate systematically breeding experiments, the cytological study of the germ-cells, and statistical analysis into the modern method of research in experimental evolution. He developed for the experimental geneticists of the World the essential features of their present experimental techniques in the analysis of evolutionary forces.